Master Hypnotists Enjoying 19 Successful Years in Toronto! Positive Changes is a network of behaviour modification centers using powerful personal coaching, combined with hypnosis, to change negative behaviours and reinforce positive ones. 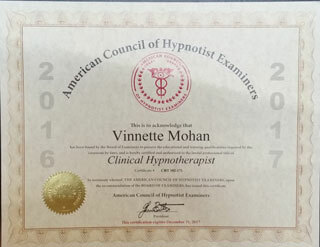 Vinnette Mohan is the director and owner/operator at Positive Changes Hypnosis in Toronto, which was founded on May 10, 1999. 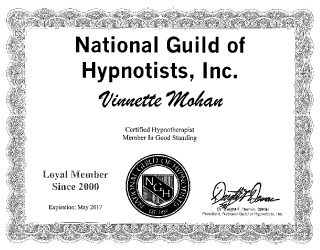 She is also a clinical hypnotherapist and a former member and co-founder of The Ontario Association of Hypnotherapists, as well as a member of several other professional organizations, including the National Guild of Hypnotists™. Positive Changes Toronto is part of a larger organization and Vinnette is currently the regional director of operations for Positive Changes Toronto. Positive Changes Hypnosis has come a long way since opening in Toronto on May 10, 1999. Special thanks to all our loyal clients for their confidence in us and for referring so many friends and relatives. I would also like to thank the many doctors who have trusted us with the care of their patients by referring them to us when traditional medicine is not enough. My staff and I hope to continue serving you for years to come. If you've read about us, seen us on TV, or listened to us on the radio, you know about the success and growth our clinic has experienced. My staff of professional, certified hypnotists assists clients with issues such as losing weight, smoking, and eliminating stress, anxiety and phobias. Visit our Programs page for a detailed list of what we offer. When you visit Positive Changes Hypnosis, you will experience the most advanced technology in hypnosis today. We use biofeed-in light and sound machines to make it easy for patients to quickly and easily achieve hypnosis. You can rest assured you will attain hypnosis using this equipment. We are dedicated to helping you achieve your goals and be the best you can be. We look forward to hearing from you soon! Here’s a brief audio of Vinnette answering questions about Positive Changes Hypnosis. For more interviews and videos, visit our Media page. Positive Changes offers a free, no-obligation consultation with Ms. Mohan, in which she will assess and design a program that is best suitable for you. The cost of the program depends upon the length and modality of treatment. For more information about our centers, please give us a call.